I would like to change the "Visual Studio 2010" folders location to my Dropbox folder, so it gets synced every time I make a change. I have searched on the internet, but haven't found a solution yet. Is it possible to change the "Visual Studio 2010" folders location from within Visual Studio 2010, specifically Visual C# Express 2010? Tools > Options > Projects and Solutions > General > "Projects location" setting. Change the others too if you routinely create templates. 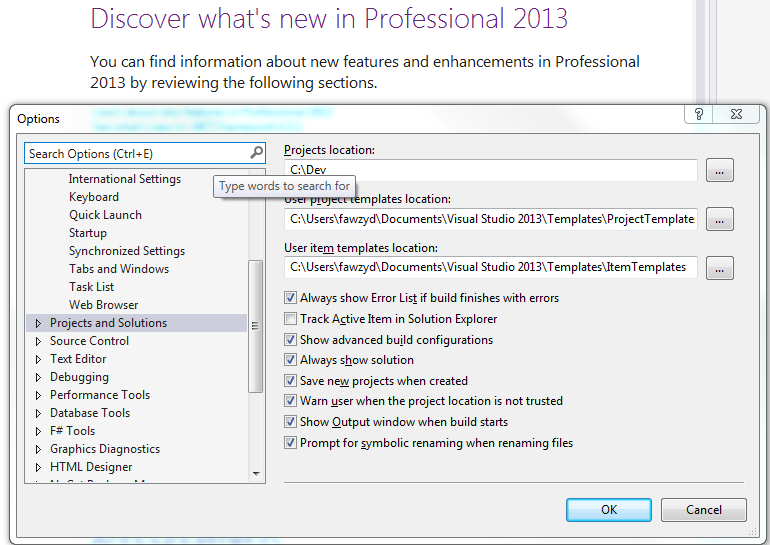 In Visual Studio, go to Tools > Options > Projects and Settings > General. Set the three locations as desired. In Registry Editor, navigate to HKEY_CURRENT_USER\Software\Microsoft\VisualStudio\10.0. Set the remaining locations that still reference Documents\Visual Studio 2010 as desired. As stated by the other answers, some of the paths are configurable (settings, default projects location, and the user template locations) and can be set under Tools->Options. However, it is important to note that the actual registry value that determines the root path is at HKCU\Software\Microsoft\VisualStudio\12.0\VisualStudioLocation, and that this value is only taken into account if HKCU\Software\Microsoft\VisualStudio\12.0\MyDocumentsLocation is set correctly. Make sure Visual Studio is not running. Open the registry editor and first make sure that HKCU\Software\Microsoft\VisualStudio\12.0\MyDocumentsLocation is set to your actual My Documents location (this is very important, otherwise some of the other paths in the registry will take on default values on the next open/close cycle) and does not have a trailing slash. If this registry value is not there, you must add it. Change the HKCU\Software\Microsoft\VisualStudio\12.0\VisualStudioLocation to whatever path you'd like the files to be stored at. (Optional, but recommended) Search for more references to the old path in the registry under both 12.0 and 12.0_Config and update them accordingly. Note that if you ever change the location of My Documents in Windows, several of the paths (including VisualStudioLocation, which most of the others are based on) will revert to their defaults, and you'll have to follow the steps above again. if above solution doesnt work try this ones. 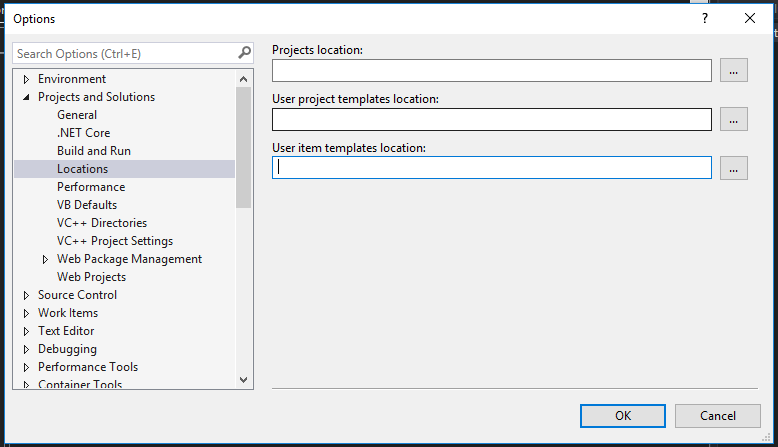 In case someone come across this question these days, in VS2017 Community there is a "Location" node under Tools-> Options-> Projects and Solutions-> Locations. The fields are no longer under "General". Not the answer you're looking for? Browse other questions tagged visual-c#-express-2010 or ask your own question. How to change “Visual Studio 2017” folder location? How to move Visual Studio's 'My Code Snippets' folder to another drive? Visual C# 2010 Express: show elements of array while debugging?